Artec and a brave scientist! Recently Artec got a chance to meet and work with a world-renowned daredevil and the bravest scientist we’ve ever met: Olav Zipser, the founder of the FreeFly Astronaut Program. Olav plans to make a series of jumps from, literally, astronomical heights in order to conduct vital scientific research. The first such jump will take place at the end of 2012 and will start at 40km above ground, breaking the existing 1960 skydiving record by almost 10km! The goal of the project is for a person to be able to jump from an altitude of 310km (!) and survive reentry. In order to achieve this, a custom-made suit has to be manufactured. This is where Artec came in to assist. Using the Artec MH scanner, Olav was scanned in two positions: full body and full body with parachute on. Scanning took 1.5 minutes and post processing took 120 for each model. Olav was asked to stand on a rotating table, in order to minimize scanning time. The optimized scans were fused at 2.0mm and each weighed about 80MB. 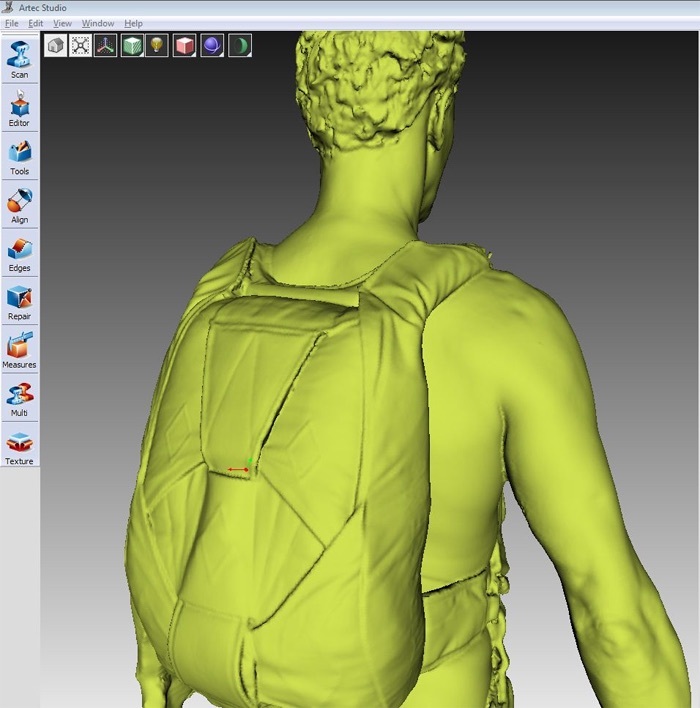 Artec: What will you use the scans for: simulation of flight in software, the production of the suit, or both? OZ: Both. I will use the 3D data to create custom made FreeFly Astronaut/Cosmonaut Space Suits. These suits have to be very special because the pilot will have to fly/control the suit from the inside using FreeFly techniques. It will be like a mini flexible space ship. I will also simulate flights leading up to the 310km one. Artec: Tell us about the flights themselves. OZ: The first one will take place at the end of 2012 and will start at 40km above ground. Four other flights will follow as soon as we have evaluated the collected data. Step by step, we will arrive at the 310km flight and we are on the way to develop the technology for this. Artec: Who is sponsoring this experiment? OZ: Everyone involved is a sponsor as they believe it is a fantastic project. We will break a lot of important aviation records and from next year on, we will begin selling advertising surface area on the rocket and space suit, as well as start producing a TV documentary on a world renowned network. Artec: And the most important question — what do you hope to achieve with this experiment? OZ: With FreeFly techniques and modern technology, it will be possible for the future space traveler to return safely in case of an emergency in space. It will also be fun and cheap to fly with full control back to Mother Earth all alone or in formation with your friends. We thank Olav for letting us help with his project and wish him and his team the best of luck. We will be following your progress closely!